It's looking very likely that the big Harriers / FGR reunion that everyone was expecting will fail to materialise with the news that Matt Gadsby and Ian Foster will both miss the game through injury. Add in the fact that Abdou Sall is quickly losing favour with the FGR management after his dismissal against Cambridge Utd a couple of weeks ago, and has now been put on the bench. Also Jon Beswetherick ( I thought I wouldn't ever have to type that name again) has not impressed their fans this season and could well find himself dropped soon. Another ex Harrier - kind of - is Mark Danks. He played in a couple of pre season friendlies for us prior to last season but failed to get a contract and ended up down there. We won't see him either because he's gone out on loan to Bromsgrove Rovers to help them try and regain the Pride of Worcestershire accolade. 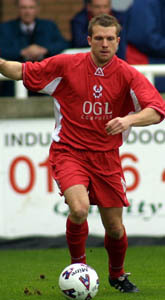 The only ex Harrier that looks certain to get a game is the keeper, Ryan Clarke. We had him on loan from Bristol Rovers last season when he played seven games for us over the Christmas period but was re-called because of a keeper crisis at the Mem. Forest Green were reprieved from relegation to the Conference South last season because of irregularities at Northwich and, to be honest, going on their results so far they could well be needing another get out of jail card this season. For us, following last weeks disappointment at Grays, we will be looking to win this game to get back up into the play off places and, with another home game in mid-week against Halifax, that's just where we should be by next Saturday. We have a couple of injury problems and the first one is with Martin O'Connor. He left the field of play just before half time at Grays but has been having treatment on his knee and is now back in training. The other is Michael Blackwood. He had a hamstring injury and, even though he made a bit of a comeback against Canvey, he wasn't fit for the next game but he is now on the way back and could well figure against Forest Green. This game will bring back memories of when we last played them at the end of our Championship season and then the game ended in fireworks. I think it'll be fireworks again and not a damp squib. Clarke, Harrison, Simpson, Searle, Sall, Richardson, Wanless, Rogers, Abbey, Teixeira, Garner, Davies, Meechan, Graham, Beesley, Danks, Howell, Haldane, Gosling, Beswetherick, Rendell, Stonehouse, Clenell, Syvestre.